MicroSD cards have been getting steadily faster over the last few years with sequential speeds that compete with 2.5-inch hard drivers and improvements in IOPS that make them more able to handle application storage. 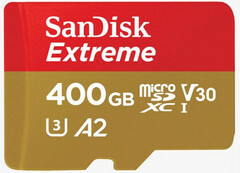 The newly announced SanDisk Extreme 400 GB is more than 50 percent faster than smaller capacity Sandisk Ultra UHS-I MicroSD cards. At MWC 2018 today, SanDisk and Western Digital were proud to announce their new Extreme 400 GB UHS-I, claimed to be the fastest UHS-I MicroSD card in the world. Sequential performance is blazing fast with up to 160 MB/s read speeds and 90 MB/s write speeds, which match or outdo many 2.5-inch 5400rpm internal hard drives. These sequential speeds make the card ideal for sustained performance with writing larger files, such as recording 4K video or burst photo capture. The Extreme 400 GB MicroSD is designed to the Application Performance Class 2 (A2) specifications, which specifies minimum read of 4000 IOPS and write of 2000 IOPS, providing some of the best application-based performance available on a MicroSD card. This is ideal for something like Android adopted storage, although the types of entry-level devices that benefit from adopted storage are unlikely to support a card of this size or to have the capability of matching its performance. Additionally, Western Digital is also running a demonstration showcasing their next generation MicroSD cards running on a PCIe interface. Only a single lane is in use, but a single PCIe lane is still roughly 1.8-2.0 times faster than the SATA III specification.